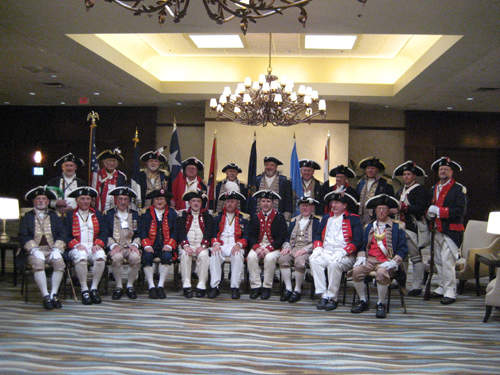 The South Central District Color Guard is shown here participating at the South Central District Annual Meeting at the Westin Hotel in Irving, Texas on August 21-22, 2009. Left Photo - Front Row L-R: Robert Northcraft, (TX); Art Munford, (TX); James Jones, (TX); Wendell Edwards, (TX); Michael Radcliff, (TX), 2009 NSSAR Adjutant Commander; Glenn Fast, (OK), 2008-2010 SCD Color Guard Commander; Joe Dooley, (TX/KS), 2009 NSSAR Color Guard Commander; Edgar Grover, (KS), 1996-1998 SCD Color Guard Commander; John W. Knox, (TX), 2005-2007 SCD Color Guard Commander; and Robert Grover, (MO/KS), 2002-2004 SCD Color Guard Commander. Left Photo - Back Row: L-R: Larry Stevens, (TX); James Johnson, (TX); Tom Whitelock, (TX); James Heath, (TX); Martin Klotzbach, (KS); Robert Capps, (KS); Stuart Denslow, (OK); Russell DeVenney, (MO); Keith Brown, Sr., (MO); Peter Baron, (TX); and Robert Hall, (TX). Right Photo - Back row: Edgar Grover (KS), 1996-1998 SCD Color Guard Commander; James Johnson (TX); Glenn Fast, (OK), 2008 SCD Color Guard Commander; Robert L. Grover, (MO/KS) 2002-2004 SCD Color Guard Commander; Stuart Denslow (OK); Robert Capps (KS) missing.